It is with a heavy heart that the family of MARGARET RABBIT announce her unexpected passing on March 31, 2019, she was of the Blood Reserve. 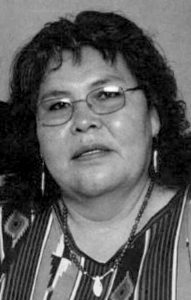 Margaret was born and raised on the Blood Reserve by the late Bob Eagle Tail Feathers and Helen Good Dagger. She is survived by the love of her life, her husband of over 44 years, Dale Rabbit. Margaret is also survived by her children: Leon, Terrance, Felicia Gail and Tyre. Her 21 grandchildren, 8 great grandchildren and 5 adopted children. Her siblings: Joyce (Gary) Bird, Michael, Wilbert Good Dagger, Kelvin (Violet) Black Horse, Robert (Yolanda) Eagle Tail Feathers and April (Dwayne) Good Rider. Her aunties: Rosie Reyes, Corolla Calf Robe and Geraldine Mountain Horse and her great auntie Theresa Vielle: Brothers-in-law Nick and John Rabbit. Sisters-in-law Bev (Doug) Poor Eagle and Joan Creighton/Many Guns. Along with several nephews, nieces, cousins; many more relatives and friends. Margaret was predeceased by her parents Bob Eagle Tail Feathers and Helen Good Dagger; her Step-parents Wilfred Good Rider and Barbara Eagle Tail Feathers; her brothers: Radford, Walter, Gifford, Wilfred Jr. Good Dagger, Carl Good Rider and Bobby Eagle Tail Feathers; her great-grandparents, George and Annie Vielle, and her grandparents: George Good Dagger Sr., Harvey and Mary Morning Bird, Frank Eagle Tail Feathers Sr. and Minnie Wings and her In-laws: Bernard and Minnie Rabbit. Margaret’s greatest pleasure was travelling and spending time with her Husband Dale, the two were inseparable and there was hardly a day that they were not together. One could always find her at bingo alone sometimes but Dale was never far. The other loves of her life were her grandchildren, she had looked forward to bringing her grandson to hockey practice or to his games, and as a grandma she had a special relationship with each and every one of them. Her strong beliefs in spirituality were a pillar of strength, that included her family and her cousin whom she called my brothers and my sister and never left them out of her daily prayers. She was committed and dedicated her life as a spiritual woman and became a member of the Sundancer Society. After her time with them had ended she had gained knowledge and teachings and came to be regarded as a respectable woman, blessed with integrity and humbleness. Margaret was supportive and cared for her cousins all through her life, she loved each of them as her own. All of her cousins would often call her daily and she was the focal point in the family. They would often say, “call Margaret she will know”. She was a source of strength and always kept the family together. She was always willing to give her last dollar to those who needed it and many times would take care of them to the end. She was a friend and a sister to everyone and she always had many stories to share and reminisce about growing up in lower Standoff and would often talk about her grandmother Mary, and her uncles and aunties. Margaret had a calm demeanor and carried herself with grace. She seemed to have an endless pool of inner strength, an innate sense of family values and a stubbornness to match, which made the perfect contrast to Dale’s outgoing yet gentle nature. Margaret was Dale’s partner in life and in business. Her continuous love, steadfastness and support gave many the strength to carry on in times of trouble or distress. She was always ready to listen with an empathetic heart and a compassion that touched any and all who came to know her. Margaret had quite the sense of humour, was very outgoing, and always had a smile on her face. She had an understanding of human nature, and a love for her family that always radiated from her and comforted those around her. Margaret was always a helping individual by nature. The light in her life was being surrounded by her family, siblings and cousins. She was a devoted wife, mother, grandmother, great grandmother, sister, auntie, cousin, niece and sister-in-law. Margaret is a great loss to many and will be deeply missed by all who knew her. We love you, and we will miss your gentle spirit Margaret! Please join the family at the Wake Service being held at the White Calf Hall in Standoff, AB on Sunday, April 7, 2019, from 7:00 pm – 11:00 pm. The Funeral Mass will be held at the St. Mary’s Catholic Church on Monday, April 8, 2019 at 11:00 am. The Interment will be held at the Eagle Tail Feathers Cemetery on the Blood Reserve, AB.